Don’t even think about tossing those shreds of a memory and losing all hope. 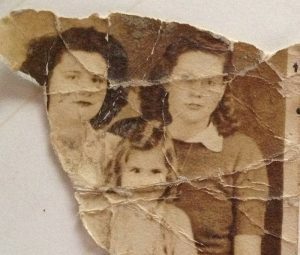 With the miracle of modern photo-editing software, it’s possible to start restoring ripped photos by simply keeping all the pieces together as if it were a puzzle you need to solve. Yup, that’s right, you’ll want to start gluing or taping all those pieces back together now. But before you do, it’s important to make sure you’re using adhesive products that won’t continue to damage the photo. There are several photo-safe types of glue and tape available to choose from, like Pioneer’s Photo Glue Stick Square Dual Edge. Once the pieces are in place (as best as they can be), you’ll need to scan the damaged photo. You can do this by sending the photo to our team here at ScanMyPhotos, where we can help you skip the next step by restoring ripped photos to their former glory. Or, you can try to scan the cobbled photo on your home scanner. While this second option will functionally work, remember the resolution and quality of the digital file will be very poor quality. Once your digital copy is made, you can repair the picture using any photo-editing software program of your choice (Pixlr is an excellent free tool to play with if you’ve got the time). If you have some basic Photoshop skills, you might be able to remove the cracks and splits caused by the damage. However, we recommend you leave this step up to the professionals. They’ll be able to restore the photo much quicker so you can free up your time to do more important things. To avoid this from happening to any future photos, we recommend you create digital backups of all print photos ASAP. Even print photos that are stored away from glue-backed albums are subject to destruction over time. Ensure your memories stay safe by scanning your photos today. This entry was posted in Blog and tagged damaged photo, digital photo restoration, how to restore photographs, old photos, photo restoration, photo tips, restoration by Monika Jansen. Bookmark the permalink.